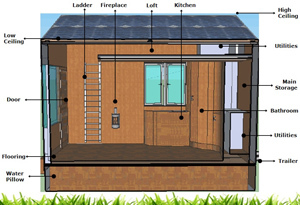 The tiny house movement reflects people's growing desire for smaller and simpler living spaces. Tiny houses are designed to minimize impact on the environment and reduce society's excessive resource consumption. A leading advocate of this movement, Jay Shafer, founder of the Tumbleweed Tiny House Company, provides pre-fabricated homes and building plans for small houses ranging from 65 to 837 total square feet. Building upon Shafer's ideas, the Northwestern Tiny House team set out to design and construct a house of less than 130 total square feet that would function as a completely independent system. 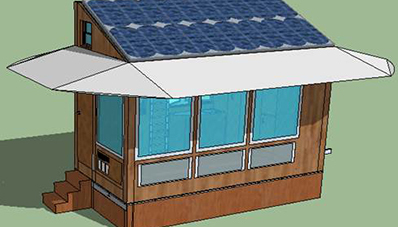 The interdisciplinary student team within the Manufacturing & Design Engineering Program and Segal Design Program made it their mission to improve upon the Tumbleweed Tiny Houses and maximize sustainability by incorporating the efficient use of space with innovations in materials, electricity, and plumbing. 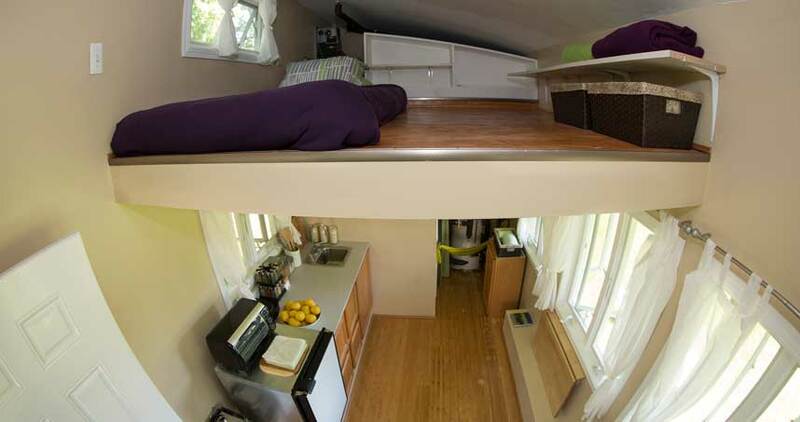 The Northwestern Tiny House is a 128-square-foot home that exemplifies the treatment of space as a resource and utilizes green engineering principles. It generates its own inputs and outputs without the need to connect to any external sources. Design and engineering considerations included the home's electrical and plumbing systems, solar panel and water tank placement, and a rainwater cachment system. The project was a student collaboration to bring sustainability awareness to the Northwestern community and beyond. What started as an ambitious class project quickly became a passionate mission to inspire future generations toward improving sustainable living. 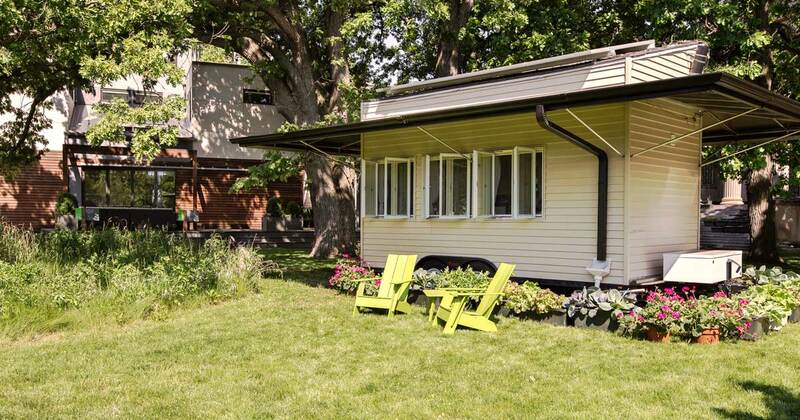 The Northwestern Tiny House has been on display at the Museum of Science and Industry in Chicago, Northwestern's Evanston campus, and the Evanston Green Living Festival. It is now permanently located at the Evanston Ecology Center. The Northwestern Tiny House began as a class project for DSGN 298-398 (now DSGN 384-1,2). First, the students needed to understand the project's scope by defining what constituted a "tiny" house and deciding what improvements team members wanted to bring to the tiny house movement. The student team decided to build a mobile tiny house under 130 square feet in size. The mobility of the house presented a challenge for its ultility systems but offered greater opportunities for community education. To better understand how to balance system functionality with occupant comfort, the team examined the designs of tiny houses sold by the Tumbleweed Tiny House Company. In addition, they reviewed the tiny houses of many amateur builders across the country and visited the 42nd annual RV show. The team divided itself into three specialty sub-teams: materials and layout, electricity, and plumbing. These sub-teams researched and designed their individual sections of the house and agreed upon a layout that fit each team's needs while maintaining the home's comfort and versatility. The team completed the classroom phase of the project in June 2010 and chose to proceed with construction. They enlisted the help of additional students through Northwestern's chapter of Engineers for a Sustainable World. After being awarded multiple grants and company sponsorships, the team began construction of the house at Northwestern in spring 2011. The home, built entirely by students, was completed in fall 2011. It was made available to the public at multiple events. Thanks to the support and assistance received from many advisers, sponsors, students, and community members, the Northwestern Tiny House met one of its major goals when it was chosen for display at the Museum of Science and Industry in Chicago. McCormick Magazine: Students Build "Tiny House"
TeamStudents from several graduating classes have contributed to the project's planning, building, and outreach efforts.